Gave you cage and a crown. Gave your life for our light". The Wren - Drwy - is a deeply mystical divine bird for the Celts. In Welsh the name of the Wren is connected to the word for Druid. - Drwy, and in Irish Gaelic, Drui-en - the Druid bird. The wise and elusive Wren is the King of the Birds - a little bird, cunning, fertile, and with a strong beautiful voice that particularly inspired the Bards, and was sacred to Taliesin, and a voice of augury for the Druid's. 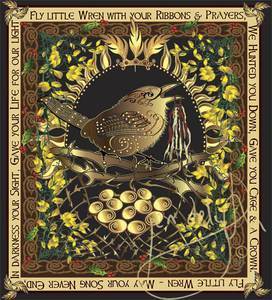 There are many folk songs - especially in Wales and Ireland, about the Winter custom of "Hunting of the Wren - Hela’r Dryw". This folk tradition has ancient roots, and potent symbolism around the Winter Solstice, when the Wren is sacrificed and given a ritual burial to ensure the fertility and light returning to the world, at the darkest time. In some customs the Wren is let free instead. Around New Years' Day, villagers hunted the wren, carrying her in a little Wren House cage, honoring "the King of the Birds" with ritual ceremony. Young boys decked in ribbons and representing the winter Holly King, parade the wren from door to door, singing songs, and they would be given gifts in return. In this ritual, the Wren represents the newly crowned Holly King, who dies to ensure the return of the light - the "killing" of the old year, to bring in the new. The yellow Gorse or Furze - represents the sun, with her rich yellow flowers, and is a voracious light seeker. The evergreen Holly tree with blood red berries, represents the Winter King, as the Oak and the Robin represent the Summer King - the seasonal cycles of light and dark. The feathers of the Wren were thought to bring good fortune, and it was considered bad luck to kill a Wren, or steal her eggs, and that the wren's nest was protected by lightening. The "hunting of the wren" now typically takes place on St Stephen's Day (26th December), as it was (unfortunately) believed that the Wren's song betrayed St. Stephen, who was hiding in the yellow Gorse or Furze, leading to his martyrdom. "Y neb a dorro nyth y dryw, Ni chaiff iechayd yn ei fyw"